AmandaKT's -while less Ryan Gosling - way more biased bowl picks. And with 10 minutes to spare before first kick off!! I am complete biased on this one folks. LET’S GO RAMS! 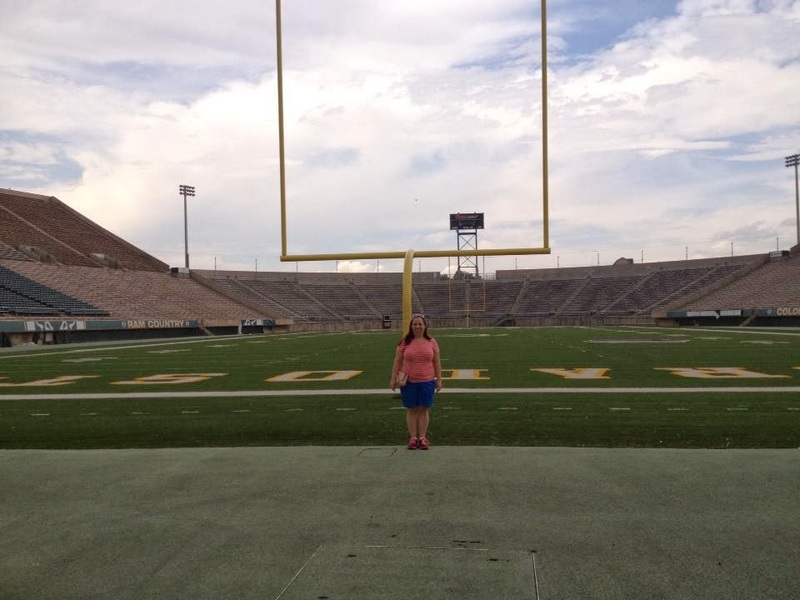 My sister works at CSU – I was there over the summer. Now, no one at the school has any school spirit but I totally love the Rams! 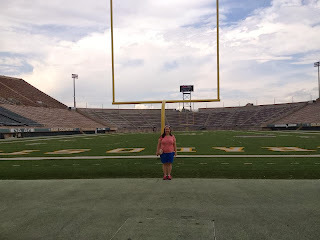 In fact, here I am at CSU’s stadium in July! GO RAMS! I love bufflo chicken dip, buffalo wings, the GooGoo Dolls are from Buffalo and I love them too. I pretty much dislike anything from San Diego. Plus I feel bad for Buffalo, their pro team is the Bills and they just can’t. So, Buffalo over San Diego. Hm, I think I always pick Ragin’ Cajuns because that might just be the most awesome mascot name ever. And Green Wave?? That makes me think of Green Latern and despite how yummy Ryan Reynolds was in lycra and spandex that was a horrible movie. However the Cajun’s are without their starting QB. Guess I’m riding the wave. Tulane puts out the Cajun fire. Well this is a no brainer. I hate Ohio and everything in it. And Pirates are totally hot. Bobcats are walking the plank in this one. This game is going to be like a hunters safety convention-so much orange. This is a tough call for me. I adore Oregon State. However my brain is saying the Broncos are going to run all over the Beavers. Unfortunately I don’t think the Beavers are ending their bowl losing streak in Hawaii. Broncos wins. First off, let me congratulate sP-I-T-T for finding a way out of the Compass Bowl. Too bad it took you to Detroit. At least the swag is Pizza! Pizza! I could care less about this game and probably won’t watch. Ugh, but it’s NBA season and I hate the NBA. Fine, I pick watching this game over the NBA. The mascot “Aggie” has always baffled me. Outside of the ‘buckeye’, it’s got to be the least frightening of college mascots. Watch out for the Farmer. OOOhhhh scary. Not. Huskies are fierce, majestic dogs. Plus Lynch is an awesome QB. Always go with the great QB. NIU wins! Marshall and Maryland in the Military Bowl. I feel like this game should be sponsored by M&M. I wonder, has Delany spoken to Maryland’s AD about their uniforms yet and said “seriously buddy, tone it down”? Does anyone know what Marshall is a ‘Thundering Herd’ of? Cows? Horses? Elephants? Either way, they are going to thunder past those Maryland turtles. Ugh, the first of the B1G predictions. These games get me every year. I want to be loyal to our brothers in arms but they always do me wrong. However, can you really bet against a team who is playing for a coach who is up in the press box? As Penn Staters know a la 2008, you can’t. Go Gophers! Classic match up of cats vs dogs. I’m a dog lover normally, but the Huskies never seem to get it right. Not to mention I think they are smarting from Sakisian leaving (who didn’t see that coming). BYU has the right colors (blue and white), haven’t lost in a bowl game recently and more importantly hasn’t lost to the Huskies in awhile. After spending too much time with my roomates cats – CATS WIN! Holy Crap! It’s NYC vs Jersey! This game is pitting Wall St guys vs the guys that drive those guys to work. Things are gonna be tense on that island. Notre Dame is winning this game. Let’s be honest. Money wins and the Queen doesn’t have any. Let’s move on. Cincinnati is in Ohio. And I hate Ohio. I’m not really a huge fan of UNC either but choose your hate wisely. Tarheels over Bearcats. I sincerely enjoyed watching Miami destroy Pitt at home this past Nov. It was truly one of the most enjoyable games to watch with Pitt fans all around. Good times. So, while I normally am not a Miami fan, for that entertainment, I shall pay them back with a victory nod. Hurricanes sweep by Cardinals. For some insane reason, there are several canvas Kansas State wall prints at the Walmart for sale. They’ve been there for ever. Somebody screwed up in purchasing. KSU has sucked in the post season and while Michigan has been rather inconsistent this season, I say they manage to pull this off like they did with the final kick to send the jNW game into OT.